Are you looking to buy Duke Nukem Forever from Steam at 45 euros? Don’t buy from steam directly! You can get a much, much cheaper deal if you buy a steam key for the game! CJS CD Keys are offering cheap duke nukem forever for just £23.50 each. That’s only 27 euros (which is $38 USD)!!! When you buy Duke Nukem Forever directly from steam, you are being RIPPED OFF! Did you know, on an average steam game which retails at 45 euros, the publisher is only selling at 20 euros! That means Steam take 25 euros of your hard earned cash as pure profit, for NOTHING! Worst of all, they will happily sell the game to poorer countries where people cannot afford to pay 45 euros at far cheaper prices! CJS CD Keys believe that paying such ridiculously high prices for games is not fair! Why should you pay more, just because you earn more than those in developing countries? It’s pure greed! Well, CJS CD Keys have a solution for you. CJS CD Keys company work by buying bulk games from overseas, and selling them in the richer markets. Usually, this would not work! Because the game discs are region encoded, which means you can’t play a game outside of it’s country of origin! Well, with digital activation codes, the games are not region locked! This means that all games will work in all regions! Because of this, CJS CD Keys can import the games in bulk from the poorer countries, and sell at a profit to the richer countries, whilst still passing on massive savings to the consumer. However – keys are still region locked when outside of EU and USA! But you don’t have to worry – CJS CD Keys source their games only from authorised distributors that are located within the EU. This makes sure that you have 100% proof of purchase. CJS CD Keys are currently selling Duke Nukem Forever CD Key at just £23.50 – which is almost half retail steam price! You receive a genuine activation key that’s taken from a sealed physical box. 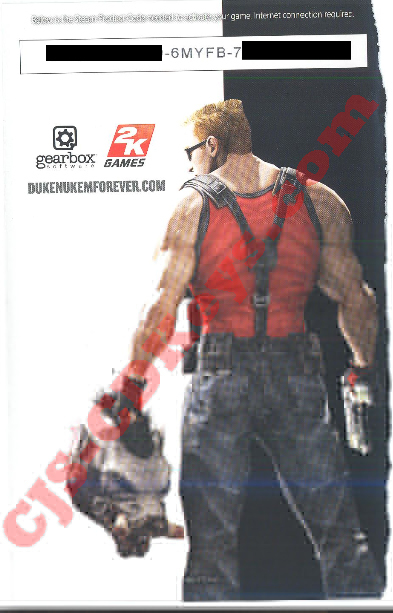 When CJS CD Keys receive shipment of duke nukem forever games with steam keys inside, we open the sealed physical packs, scan the keys, and recycle the original boxes. After your payment you can collect your code from the AutoKey system. This is an automated system where our keys are stored. You can simply make payment, collect your code on autokey, and activate on steam. Then simply activate the key on steam (free client from steampowered.com) and you will get a free full download of duke nukem forever! So once again, the link to buy is HERE! You can see this is an absolutely fantastic deal for a brand new code for duke nukem forever that can be used on steam, so buy now while stocks last! Are you looking to buy Duke Nukem Forever for Steam?? Are you considering paying an expensive price of £39.99 GBP (nearly 45 euros) on the official steam website?? Don’t pay a high price at Steam! There is a better way to get a legal steam download of duke nukem forever without breaking your bank..
BUY HERE AT $39.99 (27 euros) INSTEAD! websites such as CJS-CDKeys.com or GenuineCDKeys.com are able to offer pc game downloads at extremely discounted prices by offering scanned photographs taken from retail boxes of the game. As you may be aware, physical boxed versions of PC games are almost always cheaper than buying their download versions from places such as Steam and EA Store. However, all physical boxed games that run on steamworks platform contain keys that function on steam. Similarly, all EA games boxed game keys also include cd keys that will function on EA Download Manager. Websites such as CJS-CDKeys.com and GenuineCDKeys.com take advantage of this. They buy bulk physical pc games, but rather than sell the entire boxed package, they open the packs, scan the cd keys, and sell the cd keys alone for use on the download clients. The result? An Easy, Fast, and legal way to get digital downloads of games at a fraction of the price. Not only this, but CJS-CdKeys.com import items from countries where the economy is poorer, and consumers can’t afford to pay the higher retail price. This way, CJs-CdKeys.com can import games from poorer countries and sell them in the countries where games are sold at high prices, and making a profit – while still managing to pass huge savings to the end customer. Using this method, CJS CD Keys are able to sell Duke Nukem Forever product keys that function on Steam at just £25.99 – a huge discount from the usual price of £39.99! Yes! CJs-CDKeys.com and GenuineCDKeys.com offer easy payment methods which are safe and secure. You enter your payment information on google checkout or moneybookers, which means that CJS CD Keys don’t receive any personal data from you. only notification that you paid. This means that it’s an easy way of paying over the internet safely. Yes! CJs-CDKeys.com implement a unique “AutoKey” system. This means that immediately after you pay, the website logs your payment and allows you to immediately collect the key off their online system. This means that you can collect the code immediately after your payment, with no wait times! GenuineCDKeys.com email you the photograph of the key approximately 10 minutes – 1 hour after your payment. So, what are you waiting for? 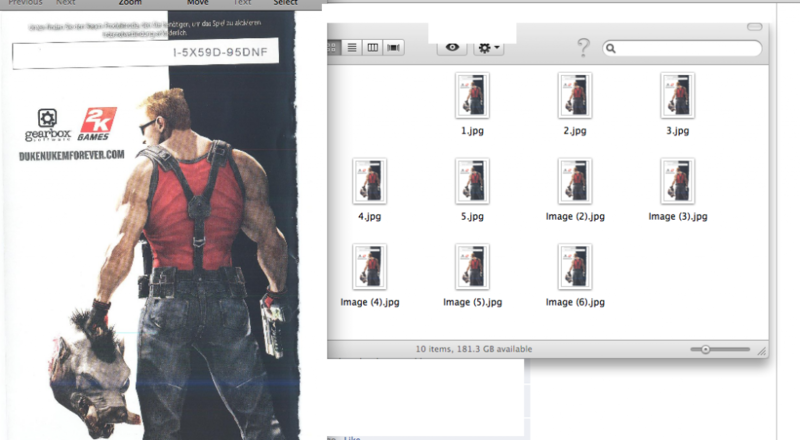 Duke Nukem Forever is an amazing new game that’s going to be heaps of fun! So why not pick up a digital download copy now at CJS-CDKeys.com and receive your key immediately after payment!